Winner//Colome amateur baseball team shut out Wagner 12-0 Thursday at Leahy Bowl. For the Pheasants, Drew Weber was the winning pitcher throwing all seven innings, allowing three hits and striking out five. Austin Calhoon was 3-3 with four RBIs powered by two triples and a double. Austin Richey was 3-3 with a double and Jared Donahue was 3-3 with two RBIs. Winner/Colome is 6-4 in Sunshine League play and 8-5 overall. The Pheasants will host Mt. Vernon in a game July 6 at Leahy Bowl. 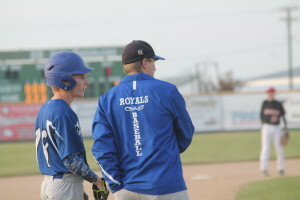 This game will start at 8 p.m.
Three Winner/Colome Legion baseball pitchers combined for a no-hitter as the Royals defeated Todd County 17-0 in six innings on June 28 in Winner. Riley Calhoon earned the win with 1 walk and 3 strikeouts. Carter Brickman pitched one inning and Andrew Laprath threw the final two innings. Nick Lantz was 2-4 with a double and five RBIs while Levi McClanahan added a triple and three RBIs. Cameron Biggins had two singles and two runs scored. 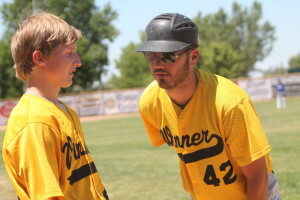 Winner/Colome Legion baseball team was nipped by Platte-Geddes 4-3 on June 27 in Platte. Ty Bolton threw the entire game giving up four runs (1 earned), 8 hits, 2 walks and 9 strikeouts. Levi McClanahan had a 2 run home run for the Royals. Riley Calhoon, Kelly O’Bryan and Cameron Biggins each had singles. 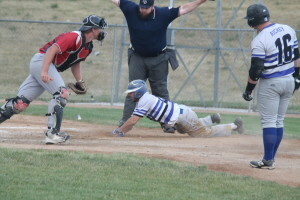 Winner Junior Legion baseball team defeated Valentine, Neb., 15-12 on June 27. Pitching in the game were Oscar Pravecek, Dalton Baker and Phillip Jorgensen. Leading hitters were Colby Kaiser with 2 hits, Jorgensen with 3 hits, Pravecek with 2 hits, Kameron Meiners with 2 hits, Bosten Morehart with 2 hits and Tyler Olson with 2 hits. The Winner Junior Legion baseball team defeated Mission 20-9 on June 29. Pitching five innings was Dalton Baker and allowed only 3 earned runs. Leading at the plate was Colby Kaiser with 2 singles and a double. Baker had 3 singles, Phillip Jorgensen had 3 singles and a double. Oscar Pravecek added a double and two singles. Shea Connot had 3 singles and Tyler Olson had 2 singles and Bosten Morehart had 2 singles. Jorgensen had 6 RBIs. The Winner team had 22 hits. 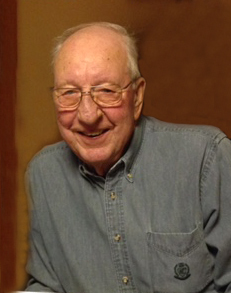 Russell Whitley, age 81, passed away with his family by his side on June 26, 2017, at his home in Winner, SD. Russell Oliver Whitley was born on April 23, 1936 in Burke, SD. Russ was the eldest of 5 children born to Oliver (Spec) and Dorthy (Ticknor) Whitley. Russ attended school in Nebraska and graduated from Naper High School. At the age of 15 he had his first job hauling propane for his dad. He then worked road construction in the summers and hauled propane in the winters. On Oct. 29, 1954, Russ married his life partner & high school sweetheart Sandra Jons in Bonesteel, SD. They were blessed with 4 daughters and 1 son. In 1962 Russ and Sandy moved to Burke where Russ began his career in the beer business, first as a semidriver for B & M Distributing then into the management position where their joint careers in the beer business began. Russ also was the first paid Deputy Sheriff for Gregory Countys. In 1967 B & M Distributing sold to Ober Torvik of Pierre. He moved the business to Winner and renamed it Torvik Distributing, managed by Russ (selling only Hamm’s and Falstaff and eventually Miller brands). This is also the same time that Russ moved his family to Winner. In 1969, Myron and Mable Kusler of Pierre, bought Torvik Distributing renaming it Whitley Central Distributing, still managed by Russ. In 1973 Russ and Sandy became the proud owners of Whitley Central Distributing, leaving the name the same. Also in 1973, Pabst brands were added. 1974, G. Heileman brands were added. In 1978 they purchased Nesbitt Bottling Co. acquiring the Schlitz brands. In 1982, Whitley Central Dist. became the first Coors Distributor appointed in the state of SD. In 2000, Mikes Hard Lemonade brands were added and 2001, Smirnoff brands were added. Through the years more brands were added including many imports, water, pop, and meat snacks. He was a past President of the South Dakota Beer Wholesalers Association May 1, 2008, Russ and Sandy sold the business to Jerome Beverage in Pierre and retired after 46 years in the beer business. Russ and Sandy enjoyed camping and traveling and spending time following their grandchildren to all their sporting events. They travelled to most of the states including Alaska and Hawaii and also traveled abroad to the Bahamas, Mediterranean, Turkey, Italy, Venice, and Greece. Russ joined the Winner Volunteer Fire Dept. on Aug. 1, 1968 and served tirelessly for 28 years, 6 of those years serving as Assistant Fire Chief. After the sale of the beer businesses and retirement in 2008 of which Russ enjoyed immensely he continued serving by becoming a volunteer to drive veterans to doctor appointments to various parts of the state. Russ did this until a year ago when his health kept him from doing so. Russ was also a member of the WELS Synods of various Lutheran Churches in Nebraska and South Dakota. On June 27 we said goodbye to our husband, father and best friend. Mike was surrounded by the four people who meant the most to him his wife Jodi, his daughters Megan Lehmkuhl and Molle Palmer and his son Merlin Schwinler when he decided he was ready to see his parents again. Mike did not want a service. He did ask that everyone have a drink and remember the good times we all had with him. The family will have a private get together at a later date. Lloyd Thomas Stukel was born on Oct. 29, 1939. Lloyd spent his very early years on a farm just outside of Gregory, SD. He is the oldest of six children. When he was very young, the family moved into Gregory for a short time. They then moved to Minneapolis where Lloyd spent most of his life. Lloyd and his mother moved to the Winner area in 1985 after his father passed away. Lloyd spent many hours visiting friends, helping his mother around the house and watching sports. Years ago he rescued an abandoned puppy he called Pepper. When he was still home, Lloyd would spend time driving in his electric wheelchair, and walking Pepper at the same time. Lloyd was a long time member of the Winner Regional Long Term Care Facility. He enjoyed watching his favorite team, the Twins, on TV, church services, the many musical events, and any opportunity to dress up in costume. In fact, Lloyd was one of the winners in a Halloween costume contest. Lloyd is best known around there as someone who likes to play harmless, yet fun tricks on the staff. 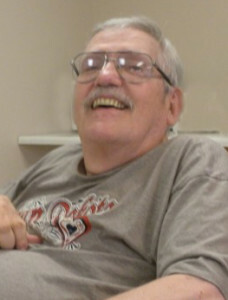 Winner Regional Long Term Care Facility was very happy to name Lloyd the Resident of the Month in 2003. The South Dakota Game, Fish and Parks (GFP) is joining a national effort to highlight boating safety. Operation Dry Water took place June 30 – July 2 promoting boating safety and responsible use of alcohol while boating across the country. Alcohol consumption and boating continues to be an issue and is listed as the leading known contributing factor in all fatal boating accidents nationwide. As part of the national event, GFP will conduct extra boating safety patrols statewide to promote safe and responsible boating practices heading into the holiday weekend. Boat sober. Alcohol use is the leading contributing factor in recreational boater deaths*. Alcohol and drugs use impairs a boater’s judgment, balance, vision and reaction time. Wear your life jacket. 83% of drowning victims were not wearing a life jacket*. Take a boating safety education course. 77% of deaths occurred on boats where the operator did not receive boating safety instruction, where instruction was known. Use your engine cut-off device. Many boating accidents involve operators or passengers who have fallen overboard. Wearing an engine cut-off switch lanyard or wireless engine cut-off device will shut the engine down if the operator is ejected or falls overboard. File a float plan. Leave a float plan with at least one person on land so they know where to find you if needed. You should be able to rely on this person to notify local law enforcement if you do not return within a reasonable hour of expectancy. Check the weather. Not only can poor weather spoil a trip, but it can also cause an emergency situation out on the water. 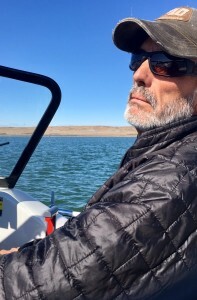 Keeton noted that state regulations require all children under age seven to wear an approved personal flotation device anytime a boat is moving at greater than no-wake speed. He recommends taking the next step and keeping a personal flotation device on all occupants in the boat at all times. New York Tribune Editor Horace Greeley encouraged people to go West, but a South Dakota newspaper editor admonished people to go East. “Any person who can take in the world’s fair and does not do so, makes a great mistake, and they will surely regret it as long as they live,” read an article in the June 8, 1893, Turner County Herald in Hurley, published by William C. Brown. It’s no wonder. The editor and his wife had spent 10 days taking in the sights at the World’s Columbian Exposition of 1893, also known as the Chicago World’s Fair. The fair had opened on May 1, 1893, to commemorate the 400th anniversary of Christopher Columbus’s arrival in the New World. Those attending the fair on the south side of Chicago adjacent to Lake Michigan would have seen buildings that stretched a third of a mile long, the world’s first Ferris wheel, exhibits from 86 foreign countries, buildings representing 43 states and territories, and much more. Many South Dakotans heeded the advice to see the world’s fair, as 19,684 South Dakotans signed the guest register in the South Dakota State building from June 1 until the fair closed on Oct. 30. South Dakota’s estimated white population in 1890, according to the census, was 328,808. The population had increased by 2,167 five years later. South Dakotans were part of an estimated 28 million people who visited the Chicago World’s Fair. Those entering the 100-foot by 60-foot building saw rooms packed with agricultural, commercial and mining displays. The main exhibit hall held more than 100 varieties of wheat, oats and other cereals. An arch was made of 14-foot cornstalks loaded with large ears and the sign, “We want you to know that South Dakota is a corn state.” The wool growers’ exhibit was considered “the best arranged wool exhibit on the grounds.” There was also a ladies’ and gentlemen’s parlor, bathrooms, gentlemen’s reading and smoking room, private offices and storage rooms. The purpose of the South Dakota Building was to showcase the state’s advantages in order to encourage immigration and to correct erroneous impressions people might have of the state, then 4 years old, according to the commission’s report. South Dakota was in dire straits, as the loss of crops to drought had caused the state’s economy to crash and forced many South Dakotans to leave the state or accept outside aid. Due to the state’s treasury troubles, private citizens provided much of the financing of the building. Gov. Sheldon formally dedicated the South Dakota Building on July 12, 1893, extolling the state’s rich soil, mild climate, deposits of minerals and other virtues. 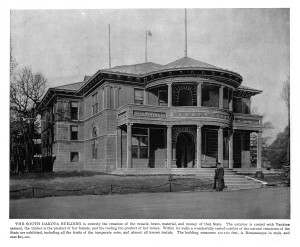 The South Dakota Building contained what South Dakota claimed to be not only the largest guest registers on the fairgrounds, but the largest in the world. The guest registers were 17 inches thick, 25 inches high and 26 inches wide, and had a combined weight of 400 pounds, according to the fair commission’s report. The guest registers are now in the safekeeping of the South Dakota State Historical Society in Pierre. Most of the fair’s buildings were designed to be temporary structures, removed after the fair closed. While the fair was underway, Old Main at the University of South Dakota in Vermillion was destroyed by fire. Many of the materials from the South Dakota Building were saved and found new life in building a new Old Main.